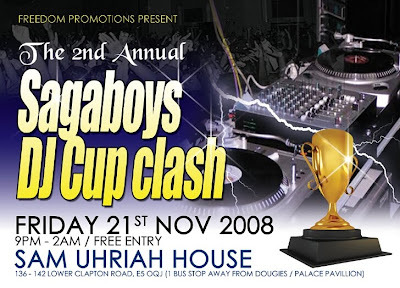 I'm taking part in the the 2nd Annual Sagaboys DJ Cup Clash on Friday 21st November 2008 and need your support. Admission is free so come down and cheer me on! Last year I came second out of twelve DJs, losing only to Daddee Samson. I'd never taken part in a clash before so wasn't quite sure what to expect, but this year I am fully prepared and want to win the cup from him! Crowd response plays a big part in judging the DJs, so the more people who come down and clap and cheer for me the better. Like last year, I will be representing the foundations of these genres with my collection of rare calypso, mento, rocksteady and early reggae on original vinyl. If you love this music then please come along. You'll hear some great tunes and be supporting one of the few DJs in London playing old-school calypso to the masses. You'll also hear some fantastic music courtesy of Daddee Samson, Lady Heartbeat and others, who will certainly be putting up quite a fight.